Introducing Cowboys and Debutantes! Enjoy these clean and wholesome, sweet historical western romances. These riches to rags shorts prove that love can be found in the most unexpected places, and that money does not always make the man. But as our debutantes know, it sure helps! Effie Stout is in her third season and beginning to worry if she’ll ever find a husband. But just when she sets her sights on a good prospect, the unthinkable happens. Her family falls into ruin. 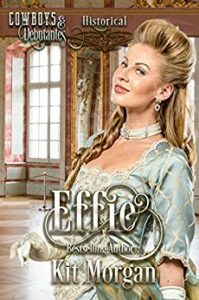 Forced to become amail-order bride by her step mother, Effie does her best to live like the other half and not get her or her would be groom killed in the process. Forrest Lang agonized over whether or not to send away for a mail-order bride and when she arrives, he soon discovers he should’ve left well enough alone. The woman is a disaster! How can he come to depend on a woman who can’t even peel a potato? Problem is, he married her. Now what? Find out in this fun romp full of humor, faith and love. Minnie Stout, along with her sisters and cousins, had been forced after a family tragedy, to become mail-order brides. Now here she was, heading west, WAY west, to California, where she’d never find so much as a crumb of her old life. 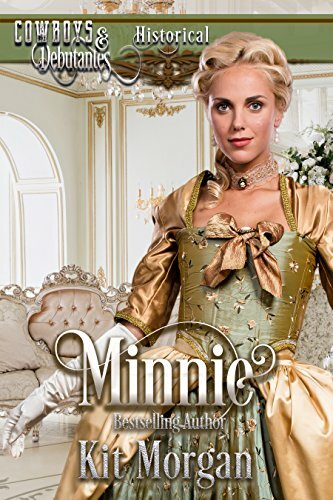 Unfortunately for Minnie, she didn’t allow herself to imagine a new one, either. Baker Stillwater was a cowboy first, a businessman second. He also had impeccable taste. Something of an oddity, really, but he didn’t care what other folks might think of him. Except his new mail-order bride, who didn’t know what to think no matter what he did. The poor little thing just couldn’t put a rough cowboy/general storeowner and the beautiful world he’d created for himself, together. But as far as he was concerned, she was just going to have to get used to it. Enjoy this third installment of mail-order brides going from riches to rags and then some! A clean and wholesome mail-order bride romance!